Telefonica Blue has won leg four of the Volvo Ocean Race, crossing the finish line in the fog at 07:00 GMT (15:00 local time). With the win Skipper Bouwe Bekking and his team earn eight points, putting them on 41.5 points overall. It was an instruments only landing for Bouwe Bekking, as the flags on the end of the Olympic harbour breakwater disappeared into the fog. It slowly rolled across the Central Business District on the other side of the bay, where only the tops of skyscrapers were visible. However, there was plenty of wind. 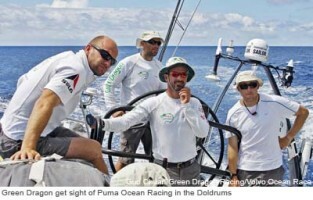 PUMA and Ericsson 4 finished second and third respectively. Puma crossed the line less than eighty minutes after race winners at 08:17 (16:17 local time). Ericsson 4 finished at 09:04 (17:04 local time) earning six more points – enough to maintain their position at the top of the pile with 45 points. Green Dragon is still racing, with 347 miles to go, and is anticipated to finish in fourth position on 31 January.